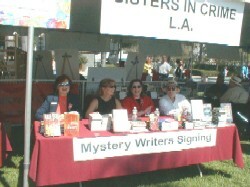 Folks turned out on a perfect California day for the 3rd Annual Book & Author Festival in Santa Barbara, where Bob shared signing time at the Sisters in Crime booth with his brother sisters (from left) Kris Neri, Taylor Smith, and Jerrilyn Farmer. 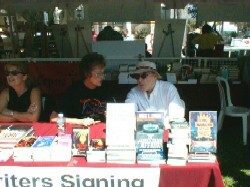 That's Diane Bouchard, prez of the LA chapter of Sisters in Crime, quietly plotting something or other with Bob. What's up, you two? 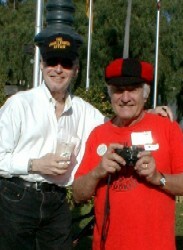 Bob with a buddy, Irwin Zucker, who led a contingent from the Book Publicists of Southern California to the fest. The organization was founded by Irwin, long-recognized as one of the nation's top book publicists. Its annual awards are named the "Irwins" in recognition of his contributions to the group and the long list of best-sellers he helped create, dating back to the legendary Jackie Susann. Hey, doesn't that make Irwin something of a legend himself?